Control Center maintenance costs are reduced to a minimum thanks to simple administration routines and the Web-administrator’s ability to provide an at-a-glance view of the entire corporate anti-virus network from anywhere in the world. Equally reliable in networks of any scale and structural complexity, from small workgroup networks to distributed intranets with tens of thousands of hosts, the Control Center offers exceptional scalability. Such scalability is assured due to the hierarchical organisation of the Control Center’s anti-virus server interactions, the separate SQL server used for data storage, and the complex communication system that exists between the servers and the protected workstations. The result is a single anti-virus network of interconnected workstations, making it possible to collect network-wide information on one server. The hierarchical organisation makes the Control Center the perfect choice for multi-branch companies whose networks are not connected to the Internet. The Control Center simultaneously supports several network protocols for data exchanges between the anti-virus server and the protected computers, allowing the solution to be used in diverse network environments. Encryption ensures secure data transfers between system components, which is why an anti-virus network can be administered from any place on the globe via the Internet. 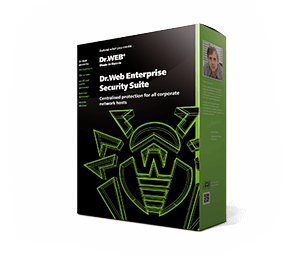 The operation of a Dr.Web anti-virus network is completely transparent. An administration audit log records all installation and configuration activities. All components can record their activities in separate log files with customised verbosity, and all file operations performed by the anti-virus software are reflected in the statistics. A notification system informs administrators of problems in the network. Such notifications can be displayed by the Web-administrator or sent via email. abnormal behaviour of protected machines. block access to removable data-storage devices, local network folders and the Internet — protection against accidental or deliberate harmful actions. for the Control Center, the following is required: Windows Internet Explorer® 11 and later, or Microsoft Edge 0.10 and later, or Mozilla® Firefox® 25 and later. You can also use Opera® 10 and later, Safari® 4 and later, or Chrome® 30 and later. for the Control Center, the following is required: Windows Internet Explorer® 8 and later, or Mozilla® Firefox® 10.0 and later. You can also use Opera® 10 and later, Safari® 4 and later, or Chrome® 20 and later.